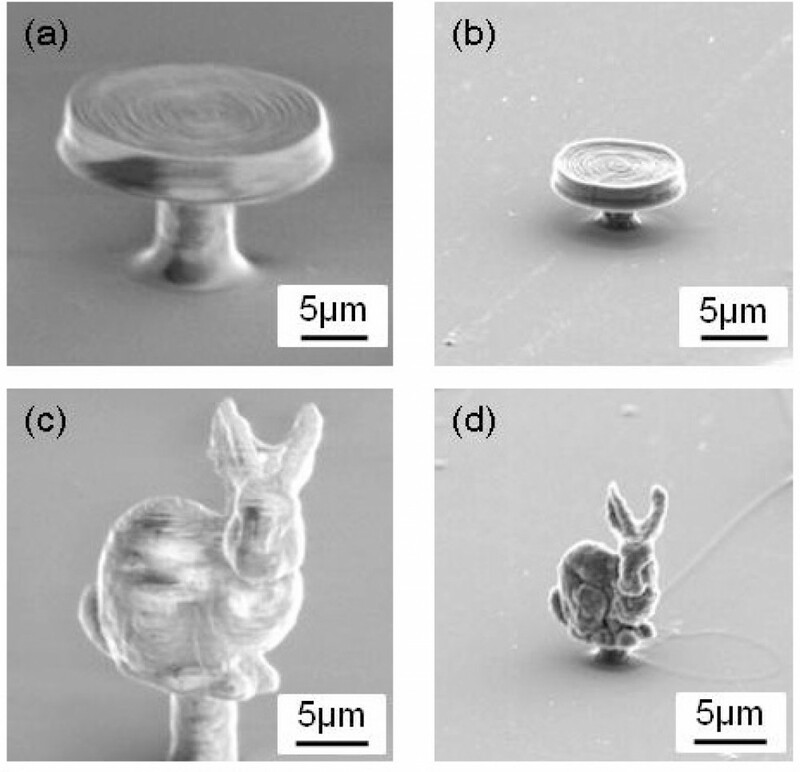 A new resin material that can be molded into complex, highly conductive 3-D structures with features just a few microns across has been developed by Tokyo Institute of Technology and C-MET, Inc. Combined with state-of-the-art micro-sculpting techniques, the new resin holds promise for making customized electrodes for fuel cells or batteries, or biosensor interfaces for medical uses. The research team, which includes physicists and chemists from Yokohama National University, presents its results in a paper just published in the Optical Society’s (OSA) open-access journal Optical Materials Express. “One of the most promising applications is 3-D microelectrodes that could interface with the brain,” says Yuya Daicho, graduate student at Yokohama National University and lead author of the paper. These brain interfaces, rows of needle-shaped electrodes pointing in the same direction like teeth on combs, can send or receive electrical signals from neurons and can be used for deep brain stimulation and other therapeutic interventions to treat disorders such as epilepsy, depression, and Parkinson’s disease. “Current microelectrodes are simple 2-D needle arrays,” Daicho says. “Our method can provide complex 3-D electrode arrays” in which the needles of a single device have different lengths and tip shapes, giving researchers more flexibility in designing electrodes for specialized purposes. The authors also envision making microscopic 3-D coils for heating applications. Currently, researchers have access to materials that can be used to make complex 3-D structures. But the commercially available resins that work best with modern 3-D shaping techniques do not respond to carbonization, a necessary part of the electrode preparation process. In this stage, a structure is baked at a temperature high enough to turn its surface to carbon. The process of “carbonizing,” or charring, increases the conductivity of the resin and also increases its surface area, both of which make it a good electrode. Unfortunately, this process also destroys the resin’s shape; a sphere becomes an unrecognizable charred blob. What researchers needed were new materials that could be crafted using 3-D shaping techniques but that would also survive the charring process. The Japanese team, led by Daicho and his advisor Shoji Maruo, sought to develop materials that would fit these needs. Trained as a chemist, Daicho developed a light-sensitive resin that included a material called Resorcinol Diglycidyl Ether (RDGE), typically used to dilute other resins but never before used in 3-D sculpting. The new mixture had a unique advantage over other compounds: it was a liquid, and therefore potentially suitable for manipulation using the preferred 3-D sculpting methods. Daicho, Maruo, and colleagues tested three different concentrations of RDGE in their new compounds. Though there was shrinkage, the materials held their shapes during the charring process (controlled shrinkage of a microstructure can be a good thing in cases where miniaturization of a structure is desired). The resin with the lowest concentration of RDGE shrank 30 percent, while that with the highest concentration shrank 20 percent. The researchers also tested their new resin’s ability to be manipulated using techniques specifically suited for 3-D shaping. In one technique, called microtransfer molding, the light-sensitive liquid was molded into a desired shape and then hardened by exposure to ultraviolet (UV) light. The other technique, preferred because of its versatility, made use of the liquid resin’s property of solidifying when exposed to a laser beam. In this process, called two-photon polymerization, researchers used the laser to “draw” a shape onto the liquid resin and build it up layer by layer. Once the objects were shaped, they were carbonized and viewed with a scanning electron microscope (SEM). In addition to crafting pyramids and discs, the researchers reproduced the well-known “Stanford bunny,” a shape commonly used in 3-D modeling and computer graphics. 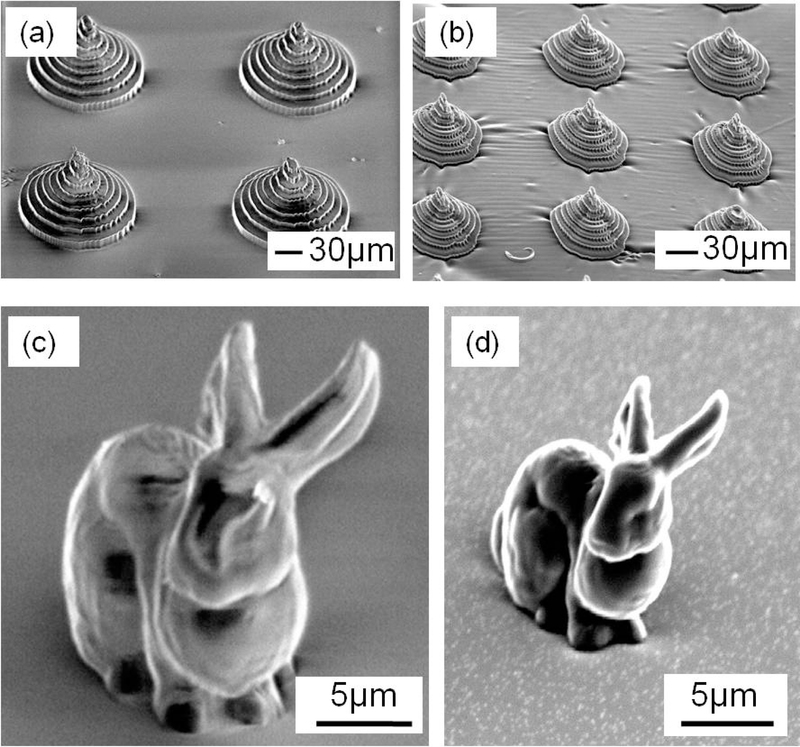 Maruo says that when he first saw a picture of the rabbit structure taken with the SEM, he was delighted at how well it had held up during the charring process. “When we got the carbon bunny structure, we were very surprised,” Maruo says. It was exciting, he continues, to see that “even with a very simple experimental structure, we could get this complicated 3-D carbon microstructure.” The rabbit’s shape would be much more difficult, expensive, and time-consuming to create using any of the existing processes compatible with carbonization, he adds. Next steps for the team include fabricating usable carbon microstructures, as well as charring the resins at temperatures above the 800 degrees Celsius tested in this study. Moving to higher temperatures may destroy the microstructures, Maruo says, but there is a chance they will turn the surfaces into graphite, a higher-quality conductor than the carbonized surfaces they have created so far.